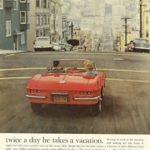 1962 was GM’s peak and it was producing 51 percent of all the cars in the U.S.
Before we look at the 1962 Chevrolet Corvette Magazine Ads lets look at some of the details about this model year. The 1962 model year was the last of the solid-rear-axle cars produced before new Split Window ’63 Sting Ray. It marked the first year for the 327 engine, both of which place it in a unique position. 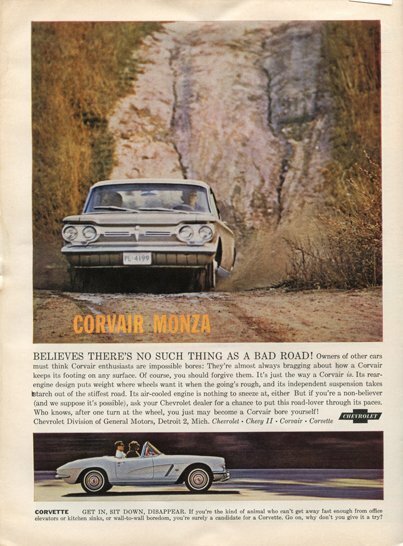 Other than the new V-8 engine, however, the ’62 was largely a carryover–as outgoing model series tend to be. 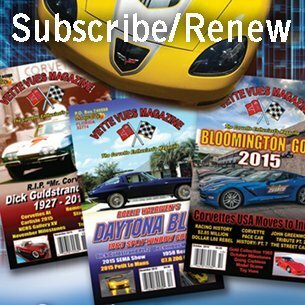 All the Corvettes were convertibles with the base price of $4,038. There were 14,531 produced that model year. The base price included the 327ci, 250hp, 3-speed manual transmission. It came with vinyl interior and a soft top. 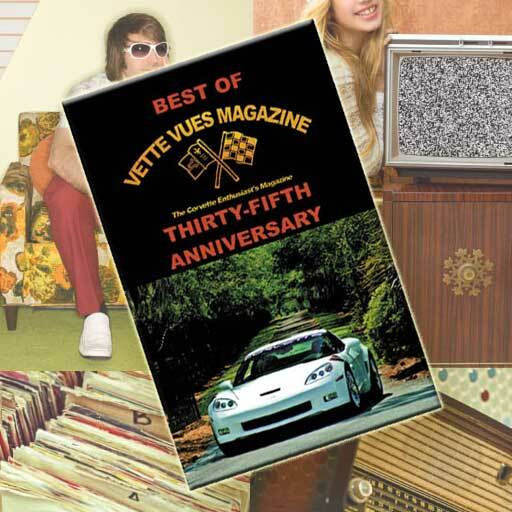 An aluminum case for the Powerglide automatic transmission was first introduced in 1962 Corvettes. This was option #313 for another $199.10; 1,532 were sold. Changes to the outside of the ’62 included wide, ribbed trim pieces added along the rockers. Solid body colors were only offered… no more contrast-color coves. 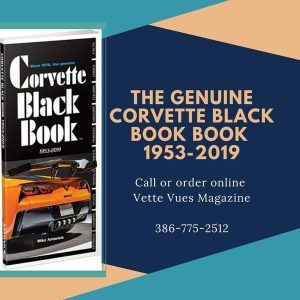 There were seven colors offered on the 1962 Corvette. They also removed the bright trim around the body cove. This was replaced by a raised outer lip molded into the fiberglass. When you look at the front, the grille was blacked out. The background of the round Corvette emblem on the trunk lid was also blacked out. For a little extra cost, you could add power windows, power folding top or an auxiliary hardtop. For the race-oriented enthusiast, they could add race gear like the 24-gallon fuel tank. This required a hardtop because the big tank left no room to store the soft top. This was option #488, and 65 Corvettes came with this option for an additional price of $118.50. Another racing option was RPO 687, as a Heavy Duty Brakes and Steering option with special shocks, brake cooling scoops and finned brake drums; four-speed manual transmission; Positraction and more. There were 246 with this option for another $333.60. 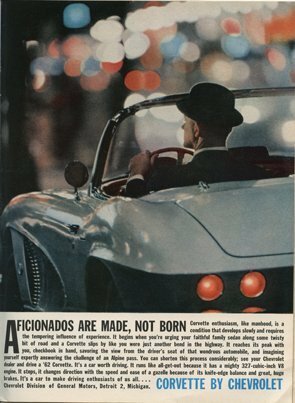 1962 Corvette Magazine Advertisement – Aficionados are made, not born. 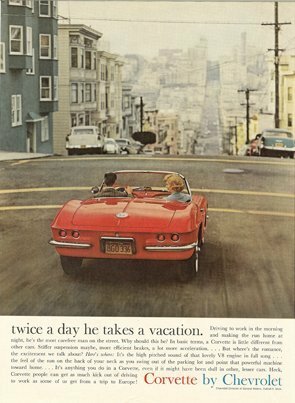 1962 Corvette Magazine Ad-Twice a day he takes a vacation. 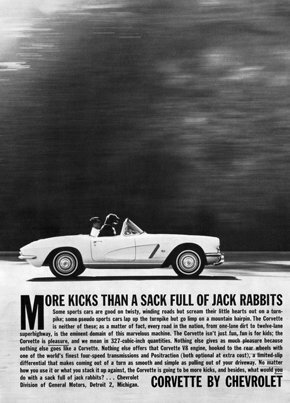 1962 Corvette Magazine Advertisement – More kicks than a sack full of jack rabbits. 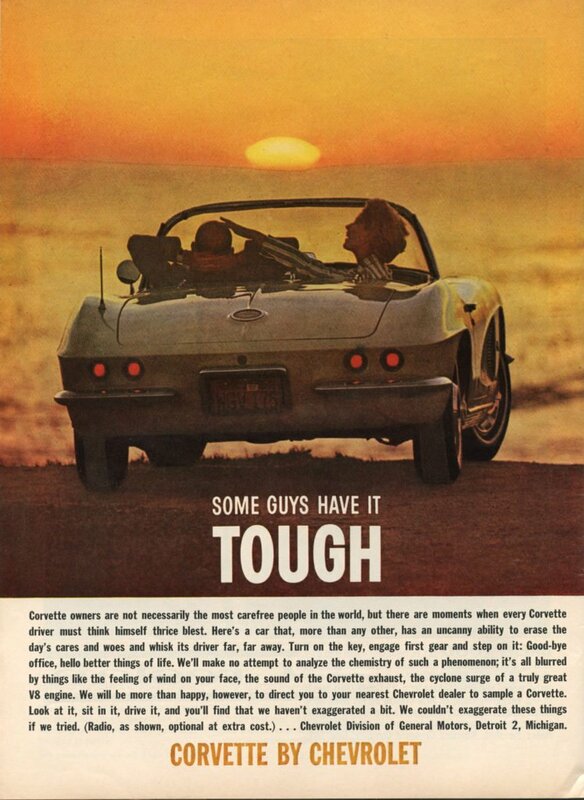 Tags: 1962 Corvette and Corvair Monza Magazine Ad, 1962 Corvette Colors, 1962 Corvette details, 1962 Corvette facts, 1962 corvette Magazine Ad, Aficionados are Made - Not Born, Corvette Print Ads, More kicks than a sack full of jack rabbits., Rear Vues, Some Guys Have it Tough	.